Very comfortable,cosy and very well equipped.great location on a quiet well kept street,nice pub a few minutes away.easy access to city centre,only a five minute walk. The apartment was clean, cosy and extremely well equipped for our stay in Inverness. We were within 5 minutes walking distance of the town centre and had a choice of places to eat and drink within easy reach. There were several supermarkets close by as well. Check in and out were easy and communication with the hosts was excellent. We received a lovely gift at the end of our stay, such thoughtful hosts. Would definitely recommend this place for those planning on exploring Inverness, it felt like home. The flat felt like a real home away from home with lovely framed cross stitches on the wallls. We really enjoyed staying here. It was close to the town and there was everything you could possible need in the apartment. Washing machine and carpark outside apartment Location was a short 10 minute to city centre. The extra touches like leaving some little uht milks in the fridge, tea and coffee facilities, towels and cleanliness. Very welcoming. Lock in a great price for Innes Street Apartments - rated 9.1 by recent guests. One of our bestsellers in Inverness! 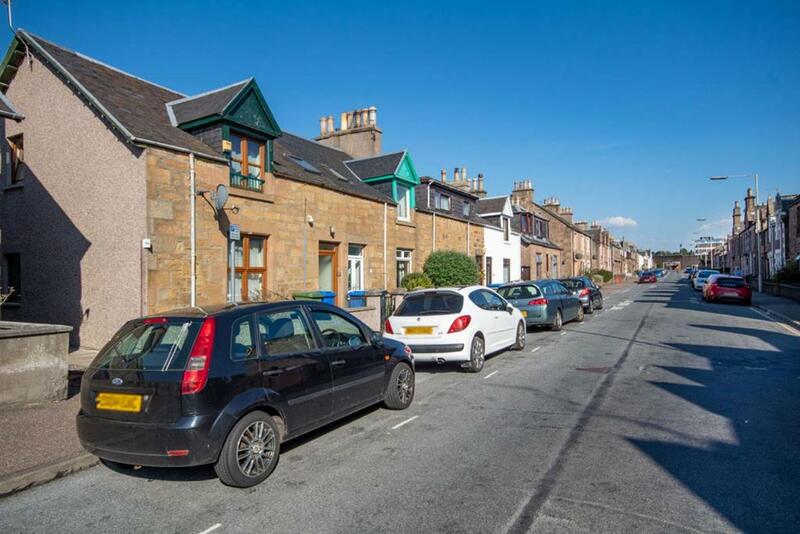 On a quiet residential street, close to the river in Inverness, this 4-star apartment is just 2 minutes’ walk from the rail station and the restaurants, bars, and cafes of the city centre. There is free parking on site, and free Wi-Fi throughout. With light, simple décor and a cosy feel, the Innes Street Apartment has a modern and fully equipped kitchen boasting an oven, fridge, and plenty of storage space. The comfortable lounge area has a flat-screen TV, and there is a bathroom with a hairdryer provided. Inverness is the northernmost city in the United Kingdom, and guests at Innes Street Apartment will find themselves well placed for exploring this historic city and the beautiful countryside that surrounds it. Cairngorms National Park is just a 25-minute drive from the building. Innes Street Apartments has been welcoming Booking.com guests since 5 Sept 2012. When would you like to stay at Innes Street Apartments? One-bedroom city centre apartment sleeping up to 2 people. It boasts free Wi-Fi and on-street parking (permit provided), and is less than a 2-minute walk from Inverness city centre. Situated on the ground floor, this apartment offers a lounge, a separate kitchen, and a bedroom. The traditionally decorated apartment also benefits from a shower room. Lounge with plenty seating, coffee table, TV with Freeview and DVD player, Free Wi-Fi internet access. Separate kitchen with gas oven, gas hob, fridge, washing machine, microwave, toaster, kettle, cutlery, crockery and glassware. Spacious bedroom with double bed, wardrobe, bedside cabinets, alarm radio. Good sized bathroom with shower, toilet and wash hand basin. The apartment is heated throughout by gas fired central heating. Hot water is on demand. A hairdryer, iron & ironing board and clothes horse are in the apartment also. Gael Holiday Homes is a family run business which has been providing rental of quality assured rental cottages, holiday homes, log cabins and apartments across the Highlands of Scotland for 10 years. We only provide quality rentals in the Highlands and operate from our booking office in Dingwall in the Highlands. We would be delighted if you choose to stay in one of the properties we rent out on behalf of private owners and would be happy to hear from you if you need any assistance in deciding where to stay. House rules Innes Street Apartments takes special requests - add in the next step! Innes Street Apartments accepts these cards and reserves the right to temporarily hold an amount prior to arrival. A local key collection point is available, earliest check-in is available from 15:00. Please note that the apartments do not have a reception or on-site staff. Key collection information will be sent via email 5 days prior to arrival. Guests must bring this information with them upon arrival to ensure access to their apartment. One or two shortcomings in the flat. Broken hair drier, water not going from bathroom sink. Fantastic accommodation in a perfect location. The sloping roof in the bedroom makes it very difficult to move around when you are quite tall and the shower is like a separate box- needs updating. Decor and furniture needs a bit of modernizing and potentially removing the clown pictures for a landscape maybe.